The online craps game can be a confusing and complicated for a beginner. Prior to joining in on an online tournament, players should have a firm grasp of the basics of the game. Online tournaments involve real money and can result in significant losses if not played carefully. There are a few methods that can help improve a new players experience with the game. The first step to playing a game of online craps is to understand the table layout. Each player in the game of craps will have the choice to place bets on certain areas of the table. Players have the option to choose the Come, Pass Line, Odds, Place or Field spaces. During the game, players will have the option to become the shooter and roll the dice. The game is fast moving and can be confusing for those that are not experienced with the basic aspects of the game. Beginners can focus on the Come and Pass Line during to learn the basics of the game. 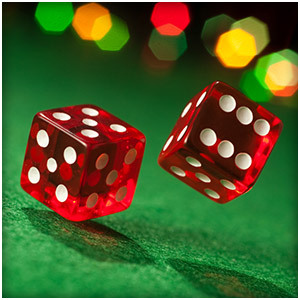 Placing a bet on a craps table is basically wagering that the person rolling the dice will have a winning combination. Players are not competing against the dice roller, but are betting on how lucky the shooter will be in producing a winning combination. If the shooter does well then all of the individuals that placed winning bets will also win. While a player is the shooter, they must place their bets on either the Pass Line or the Don’t Pass line, also known as the Win and Don’t Win bets. Each game is played in rounds and the bets are based on the outcome of each round. The rounds begin with either the “Come out” rolls or the “Point”. If the shooter rolls a 7 or 11 during the come out roll than the shooter and all players with bets on the pass line will win. If the shooter rolls a 2 than the shooter loses, everyone who placed their bets on the Don’t Pass Line will win. All other numbers will result in a point and the shooter can roll again in order to match the point. Shooters are replaced at the end of the round, or when the round is lost and the dice is moved clockwise around the table as each player takes a turn. There are several additional strategies that players can participate in order to improve their chances of winning the online craps game. Understanding the basics can help a beginner navigate the craps table until they have mastered the strategies of the game.